You’ve been studying for a while now. You begin to lose concentration. Your brain even starts to hurt. You can’t take it anymore. The solution is simple: You need a study break along the Lakeshore path! What is the Lakeshore path? 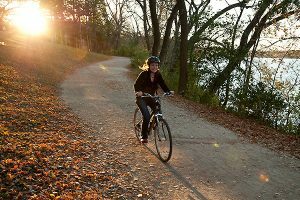 This picturesque trail ties together the entire Lakeshore Nature Preserve, a beautiful scene along Lake Mendota. You can walk, run, and even bike along the Lakeshore Path and enjoy the beautiful scenery and serenity of nature. I run along the Lakeshore path almost every time I study. Each time, I come back to my desk feeling refreshed and ready to take on a new challenge. You may think that this feeling is personal, and may not work for you. Think again, because my study break is backed up by science! Exposure to nature can noticeably improve the feeling of cognitive fatigue from studying. According to research from the University of Melbourne, looking at nature can drastically improve concentration levels. I notice this every time I take a minute to enjoy the calming scene of trees and the lake. My attention span is significantly better after. Exercise can also considerably restore mental abilities. Studies from both Columbia University and the University of Hamburg confirm that physical activity increases brainpower. I agree with this, because after my run on the Lakeshore path, my memory is far better than before. So next time you need a study break, consider doing some form of physical activity along the beautiful scenery of the Lakeshore path. You’ll come back studying better than ever.